BOOM! KRAKOW! Alex de Campi, CrissCross and Snakebite Cortez Talk 'Bankshot' – AiPT! 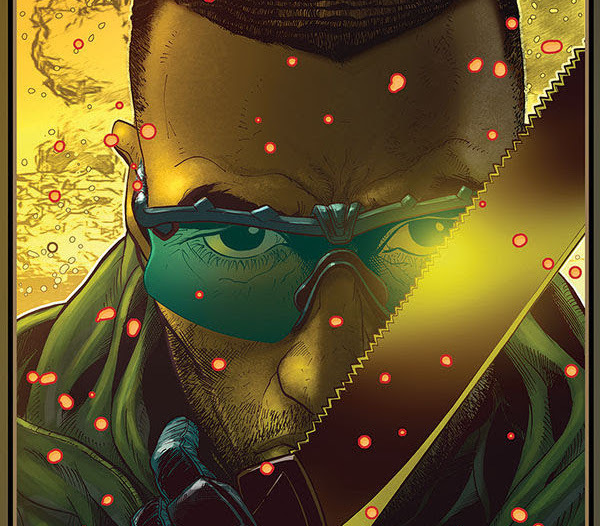 Out this week from Dark Horse Comics, Bankshot is a new action series about a man named Marcus King who may be a modern-day Robin Hood or a terrorist – or maybe both. The series is written by Alex de Campi and drawn by CrissCross, with colors by Snakebite Cortez. We had the opportunity to pick the brains of these fantastic creators to gain a little insight into this exciting new series. AiPT! : Thank you for taking the time! First off, can you tell us a little about the book? Why is it called Bankshot (is there basketball in this book?!)? Alex de Campi: The book is called Bankshot for a couple of reasons. Originally, the story was going to be about a gold heist in London — until I started working on the script and realized I was having trouble with it because I was writing the sequel first. I needed to start at the beginning. I kept the name, though. It’s also an Operation Ivy song I really loved and when Valiant brought out Unity (another Op Ivy song title) I was like, “well, we clearly need more action miniseries based on Operation Ivy songs.” Alas, there is no basketball in the book. ChrisCross: Bankshot is a billiard reference also. AiPT! : When and where can readers expect this book to take place? A follow-up: How has that made that challenging or a pleasure to tackle? Alex de Campi: It takes place both right now, and about 15 years before. We’re constantly switching back-and-forth between an operation Marcus takes on for the Russians, and a North African special ops job gone wrong. Formal challenges are what make a book interesting for a writer, and going back-and-forth between two time periods (which allows us to slowly parcel out incredibly relevant/crucial information) was a lot of fun. Will I do it in every book? Of course not. But it’s been a blast (pun intended) with this one. ChrisCross: As an artist, it’s my job to get the most out of a script. So if the character, in this instance, Marcus King, becomes the journeyman that will be on this adventure, I have to convince you he’s there as well as convince you it really exists. You’ll see flashbacks of Marcus in the Middle East in various stages of life leading to his present appearance, who he meets, and how he meets them. Alex does the clever thing in not separating the origin from the present into separate stories that take forever to tell, but incorporating them so that the lines meet to each situation in the arc as you read. Alex nails his identity on the head. He’s spirited, as he should be giving what he chooses to do, but he’s a good man who’s spiritually locked in this realization that he has to cut out this cancer to be free. If he doesn’t, it’s just going to get worse. AiPT! : ChrisCross, I really love your work and recently had the opportunity to see a full-sized poster of your DMC cover in a gallery in Las Vegas (with the Dark Knight inspiration). How did you connect with Alex and Snakebite for this project? ChrisCross: Wow. I forgot about that! I think that was the Frank Miller homage cover I did for Edgardo Miranda-Rodriguez and rapper DMC. I had fun with that. I’d love to see a picture of that poster in Las Vegas sometime soon! A mutual friend told me about the project. At the time, I was in the middle of a potentially massive project that eventually failed. I read the script and chomped at the bit to get started. Snakebite Cortez and I worked together on projects before and it was always a stellar experience. We push each other to see how far we can go when we collaborate. We mesh well, and I couldn’t do this project without the man. You can’t let your artistic spiritual animal go once you find them. He’s REALLY good at what he does. I’m never concerned about what steps he takes to make my art shine. We tweak things here and there, but it’s always a great collaboration. When Alex called me, I called Snakebite. AiPT! : What made you fall in love with comics? ChrisCross: My imagination has been a big deal ever since I was a kid. My elementary school teacher would tell you about my mom constantly having to visit the school because of my daydreaming and epic stories (the T-Rex in my bedroom story is legendary). Back in the day, I learned my dictionary words from reading comics. The combination of pictures of art with a child that reads everything means the kid is never coming out of his room. My brain would never shut off. I altered my alternate universe career as an architect to become a comic artist. The greatest day in my career was showing my parents the first comic I did to show them how serious I was about my craft. AiPT! : The summary reads, “…And punch a small army of dudes. And blow up stuff. Lots of stuff.” which instantly makes me wonder, how much of this book is going to be all-out action? Alex de Campi: Most of it. ChrisCross: From the first issue “BOOM” and “KRAKOW” are your visual friends. The action is primo in the story from cars and trucks crashing to bombs exploding. My work is considered highly kinetic, fluid, and dynamic in action scenes. Someone called me “Action King” once, and now I have to own it. I hope I succeed! However, the characters have to act, and the storytelling must be crisp. The script has a lot of tall orders, and I pride myself on making those concepts pop. I’m sure everyone reading Bankshot will enjoy the ride! AiPT! : Alex, your previous work is always well researched and I’m curious, are there any subjects or times in history you looked into specifically for this work? Alex de Campi: Bankshot is less of a stone-cold historical research book than my others. In some ways, that’s why I wanted to do it — so I wouldn’t have to read 2,000 pages of autobiography and stuff before sitting down to write. (“Have to,” I say, as if I don’t enjoy every damn moment of historical research.) I did some basic research on the weaponry, squad composition, and vehicles of the regiment Marcus was in, but beyond that, I went crazy and just made a bunch of s--t up. It felt liberating and dangerous. AiPT! : ChrisCross, has there been anything Alex has made you draw you had a hard time with and anything you’ve just loved drawing? ChrisCross: Alex is definitely challenging me but in a good way! I don’t want my abilities to get stale, and everything she throws at me has such variety that it keeps me sharp. It’s more difficult than just drawing superheroes, which is fine with me! The Bankshot concept is reference heavy, and I’ve learned to ad lib to get the most out of it but still tell the story. It’s easier to ad lib in the superhero world than in the world Alex creates in Bankshot. It forces me to draw things I wouldn’t normally draw, and that’s a great thing. I’ve drawn more Hummers, European trucks and cars, and guns than my lifetime quota in this book. AiPT! : Snakebite, Bankshot is full of really action-heavy pages. How do you use color as a way to emphasize the force and speed of what ChrisCross has drawn? Snakebite Cortez: I’ve had the honor to work with Cross a few times throughout my creative journey. I love working with him for many reasons. I think we compliment each other’s art very well. I am blessed to have some great collaborators. It’s all about when to use saturation, warm and cool tones while utilizing plenty of atmosphere effects, i.e. not being afraid to color over the line. Compartmentalizing chapters/scenes in the story with their own unique feel and popping the contrast and chroma when the tension rises. I like to keep everything rather neutral and keyed in and push the values and hues when the temperament of the script calls for those choices. Plus, Cross and I have a history, which gives us an advantage when it comes to effective execution of intention. Also, regular communication with Alex helped with this process because she also has a vision that should be considered to solve creative problems. In other words, it takes a tribe to color! AiPT! : If turned into a TV show or movie, who would you want to direct and why? Alex de Campi: I’d vote Gareth Evans, who directed The Raid. ChrisCross: There are so many! I’m good with Steven Soderbergh or Antoine Fuqua or Ava DuVernay! I think it’s important to have someone who can direct the quiet moments as deeply as the action. TV-wise, it’s a toss up. I don’t think there’s ever been anything like this on television conceptually. The director would have to be someone with a grandiose vision and cleverness. AiPT! : Is there a part of the comic-creating process you love the best? And a part you don’t like? ChrisCross: The best part of the process is always developing the visual for the characters. The love/hate relationship comes in the storytelling itself. Your brain can go everywhere and nowhere all at once. If you get too much reference, you can shut down. If you get too much information in a script, you spend a lot of time separating and editing to make it “read” smoother visually. This can lead to a cramped feel with too many panels on a page. Those situations can lead to a mental block, which is the worst on a deadline. That’s when it gets brutal! Trying to capture what’s in your mind on paper to tell that story is a constant struggle, but it’s what artists like me love to do. We are enraptured with the challenge, and we can’t stop doing it. AiPT! : What talent or superpower would you like to have (not including flight or invisibility)? Alex de Campi: Immortality would be pretty cool. ChrisCross: Supreme wisdom and intelligence. If you have those, you can make whatever superpower you wish!